…shoo, muthafucka…because, to paraphrase Cormac McCarthy, what’s wrong with Weenter is wrong all the way through it. Thence back into the tin can on Wednesday morning for the trip back to the future, where global warming is all. I only hope there is a great snow that prevents 2017 from arriving on time. Speaking of Cincinnati chili, prior to our trip to the Ball Park refugees from Cincinnati highly recommended the Skyline Chili, which we were told was the best thing to eat in the entire tri-state area, and we had every intention of trying it. However, the superficial appearance was just too off-putting and we left town before summoning the courage. Would you be able to compare Skyline Chili with Camp Washington Chili (which, if it actually resembles the photo, might be delish)? Of course. Let’s begin with the ambiance. Skyline Chili is what I’d call OK for a fallback option – mass produced, industrially diluted Cincinnati chili, and Skyline outlets all look the same. Camp Washington Chili is produced daily in small batches at one location, a James Deanish looking diner on the corner of Colrain and Hopple. It’s heartier, thicker and tastes like it has less salt in it – probably because, in small batches, it all gets eaten within the day it’s made and doesn’t need the preservative effect of all that salt. 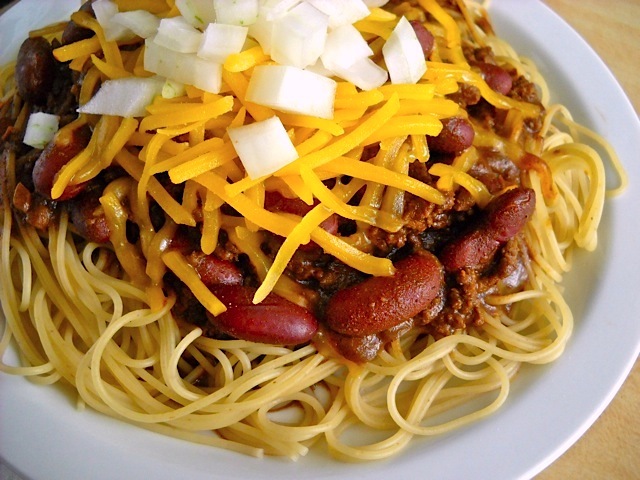 Cincinnati chili isn’t like the Tex-Mex variety you’re used to. It’s actually a mutated Greek pasta sauce similar to what you’d find in a good mousssaka, but with added items like cocoa, cinnamon and allspice. In full bloom, it’s served over spaghetti with red beans, diced onions and lots of shredded cheese (known as ‘five way’). I can’t verbalize how good it is. You just need not to expect the earthen heat of Mexican spices against your palate. Relax and let this stuff work its wonders on your taste buds without having to deal with the shock of unrecognition and everything will be all right. At Camp Washington, you can order a breakfast of fried or scrambled eggs with a side of chili, diced onions and cheese, which I promptly dump over the top of my over-easy eggs on whole wheat toast. Dear Buddha, did I get grrreat seats or what? I’m four rows back from the center of the stage. This all has an epic feel about it. Humble thanks for taking the time to put the world back on its axis. On the basis of this stellar analysis I am confident I can persuade certain others very near here into another baseball trip to the Ball Park before Joey Votto retires in 2189. No, no, take a side trip to Camp Washington – get off I-75 at Hopple Street, go west less than a block to Colerain and you’ll see it on the corner to your right. Trust me on this. Go with the best first. Okay, I’m sitting here at CVG – the call sign for Cincinnati Airport – waiting for American Airlines to send up one of its flying sardine cans (the aforementioned ERJ-145, which it claims to be phasing out of service but which still looks pretty opaque to me) to fetch me back to the tropics where I belong. The concert last night was transcendent – Karin was at her queenly best and Linford was his wry, drollful self, not to mention on fire on the Steinway grand (much like the one I’d like to see snap its ropes and land on Ted Cruz; if my parakeet had a face like his I’d feed it to my tegu). Ah, but it’s Christmas, right? (BTW what is “Xmas” – Christmas for adults only?). They were ably abetted by the Cincinnati Pops orchestra and members of the Cincinnati Youth Choir who were wonderful even though, by and large, children are horrible. In addition to their 25 years’ worth of brilliant original folk-rock and hybrid jazz music, Linford and Karin have produced three albums of “reality Christmas” songs – songs that confront not just the mythography and nostalgia, the groping for discarded innocence, but the darkness that descends with such heaviness on the lonely and bereaved during the holidays, the disappointed expectations, the sense of cosmic betrayal. And yet, these songs are very beautiful. The title of their first Christmas album, The Darkest Night of the Year, will give you some idea of what they’re about. Tonic for the kitsch in the elevators, that’s for damned sure. For those of you who’ve never experienced an Over the Rhine concert firsthand, it’d be near impossible to convey what uncanny heart to heart experience it is to listen to them and to watch Karin Bergquist sing. On the other hand, enough of you have spent long hours rotting in airports that I don’t need to invest much expertise in description of how boring it is. I expect, even when this is over and I’m home mixing myself a carambola colada, to remain bored well into the weekend.